This was a beautiful morning trip. We hit the bay way by 5:47am. The sun had not yet begun to peak over the trees, but there was already plenty of light...civil dawn as it is called. The air temperature was 74° and a quick check on my phone told us the water temperature was a nice 84°. The wind was a mere 3 knots. When we reached the park it was just about idyllic. Soft little thoughts of waves ambled up to the shore. We unloaded and were even a little surprised at how cool 84° can feel against bare 98° skin which had not to long ago been nestled warm under the covers. The water didn't stay cool for long, though. The coolness was a fleeting thought as we first stepped our toes in the water surprising a few baby crabs looking for breakfast. We paddled southward and marveled in the beauty of the morning. The glow of sunlight was becoming visible on the building on the western shore, but the trees behind us blocked our view of the sunrise. A refreshing breeze blew along, not enough to help us, not so much as to hinder us, just enough to add another layer of pleasure to an already wonderful morning. As we paddled along, the pelicans were dive bombing for their breakfasts. Only once did I see one come up without a snack for his efforts. They would quickly swallow their treat as soon as they emerged from the water and then fly away as if they were afraid we would be doing the same thing to them. After thirty minutes or so (I'm not sure because I had forgotten my watch) we stopped for a water break. When we do this, we connect our two kayaks together (unless the water is rough and then it is hazardous to do so.) I enjoyed looking out at the expanse of blue in front of me. The Bay, and then the Gulf of Mexico and then the ocean spread out before me as far as I could see. There was nothing before me but water. The sky was a gradient ceiling of aquamarine and London blues and flowing into the floor of the deep turquoise and sapphire of the water. (Is there a significance in the fact that I describe these beautiful things by gemstones?) I didn't even bother taking my camera out of its waterproof container because I knew there was no way it could do this sight justice. As we paddled past the bay houses and their piers I wondered about each one. Some seemed made of simple materials, yet perfectly created for their purpose, with little ladders to reach down into the water and benches upon which to fish or watch the gorgeous sunsets, some even had what appeared to be showers. Others seemed so ornately designed and created, yet appeared to lack the practicality that would seem so necessary out on the water. Why have the boat house at all if it couldn't house a boat, or give you a place to sit or fish or swim? Why have it if it were just for looks? As we were paddling back, we encountered some waves pushing back from the shore. We found ourselves parallel to the waves, a situation one wishes to avoid in a kayak especially if the waves are of any significant height. If these had been any higher, we would have had to change our direction so that our bows but as it was, they were only annoying and didn't cause us any threat of capsize. After a few minutes the waves leveled out and it was a simple easy paddle back to the put in. But I had a little surprise in getting there. I had gotten my sights wrong along the way and I thought we had much farther to go than we did. When Glen started heading toward shore, I thought he just wanted to paddle further in that we had been, then I realized the put in was upon us. I have always said that things look so different coming back than they do going out and it was surely the case today. I usually make a point of making visual notes along the way to help remind me. We paddled our boats right up onto the shore and started to load up. This meant that we were walking through the water into the sand to the car. I know this sounds obvious, but in all our years of kayaking in rivers and our years of not going to the beach, I have come to appreciate the lack of sand. I spent several minutes trying to eradicate every grain of sand from my feet and shoes. Finally, I walked out onto the pier and put my feet into the water to wash off my shoes and feet. That's when I saw the little fishes swimming by. It was like the last little wonderful part of an already great day. I have seen a lot of beautiful things in my life. When we were in Washington, D.C. we were riding the Metro and I saw the most beautiful woman I have ever seen. She had creamy brown skin, silky long black hair and huge black eyes. It was her eyes that drew my attention and kept it. I have never seen a more beautiful set of eyes on a woman. I know she must have thought I was crazy, but I could not stop looking at her. While we were in New York, we visited the Statue of Liberty. Seeing that statue so proud and tall in New York harbor was an incredibly beautiful site, one which brought tears to my eyes. I have often thought one of the most beautiful things in the world are little baby feet and hands. I am blessed to work in a place where I am given the opportunity to see such sights regularly. My husband and I frequently choose to kayak either at sunrise or sunset and the rising and setting of the sun never fails to amaze me with its beauty. Each time I tell myself beforehand that I am not going to bother to take more pictures and each time the beauty astounds me and I begin snapping away. My grandchildren love to look at the pictures of Ireland I have as a screensaver on my computer. We go through the pictures and they talk about each one and why they like it so much. The green hillside, the waterfalls, the beaches are some of the most beautiful pictures I have ever seen. Amid all these beautiful things though, we cannot find the most beautiful thing we will ever see. That is yet to come. No matter what beauties face us in this life, there is one awaiting us in the next that will outshine everything we have ever known or thought of as beautiful. One day we will look into the face of the Lord Jesus Himself and all thought of previous beauty will fly away, for He alone will be that one thing most beautiful. How wonderful to thing that our best days, our most beautiful sights, are yet ahead. Happy reunions on streets of gold. But Jesus will out-shine them all." I love beautiful flowers. My favorites are white roses, hydrangeas and tulips. But I love all kinds of beautiful, colorful flowers. I especially love photographing them, perhaps because I seem to be allergic to almost anything that grows, so I can best enjoy most flowers by looking at a picture, rather than having a vase of them in my house. The other day we were visiting a house near our neighborhood and I saw a vine growing on a mailbox which had blooms unlike any I had ever seen before. If I had not seen the flowers with my own eyes, I would have never suspected the flower was real. In fact, even looking at it, I had to reach out and touch it to make sure it was actually real. Sources tell me this is called a passion flower. As I thought about this unusual flower, I began to ponder the mind of Creator who would fill His world with all sorts of plants, flowers and even creatures. When I think of how many different flowers I know, more than I can name, then I think of how many exist that I don't have any idea about, I am simply astounded at the magnitude of our Lord. Not only that He can create so many different types and varieties of flowers, but that He would. Why would He do this? I think the answer is simple. For our pleasure. He wants us to enjoy them, to look at them, to smell them, to touch them and to enjoy these expressions of Him. In some way, every petal of every flower shouts out the truth of the Lord Jesus, only our blinded eyes cannot see. One day though, we will see the world with glorified eyes, and we will be astounded at the beauty that is hidden from us now. Not beauty seen with the eyes or smelled with the nose, but beauty beheld with the spirit as the Holy Spirit reveals to us the truth of our Savior throughout His Creation. be unto Him that sitteth upon the throne, and unto the Lamb for ever and ever. And the four beasts said, Amen. and worshipped Him that liveth for ever and ever. " I guess if I can be Clintonesque, it really depends upon the definition of the word "trip." If a trip is to depart and then to return, then Trip 47 has occurred. If a trip means getting into the boats and pushing off into the water, then Trip 47 has occurred. If a trip means going further than five feet from the put-in, then no, Trip 47 did NOT occur. Our goal was to leave early enough in the afternoon to avoid the five o'clock traffic, but late enough to also avoid the heat of the sun, which punished me so much last time. We set out around 4:30pm. While the westbound traffic was already heavy, the eastbound lanes were clear. We headed again to Daphne, but this time to May Day Park, the area we had seen from the water the last time we were out. I had looked it up on the satellite map and then plugged the address into our GPS. It is a beautiful little park with shady oaks, a nice boat launch and a large beach area. We unloaded and put our kayaks on the beach but our focus was on the wind and the waves that wind was creating. This was definitely some rough water and it would clearly be a challenging ride for us. Even well past the shore the swells and waves kicked up. We found it hard to hold onto our kayaks in waves to even sit into them. I found it was best for me to back up to the surf where my weight would wedge the boat against the sand until I was ready to push myself off with the paddle. I had to push hard with the paddle to get past the waves. I paddled out about five feet and then turned back to check on Glen's progress. He too had decided to back up to the surf to enter his boat. Glen's higher upper body mass in relation to his small kayak makes him less stable in his kayak than I am in mine. He quickly made the call, "It's just too rough." Even once we made it past these waves, there would still be a higher risk of capsizing with this wind. We pulled our boats in and decided to walk around the boardwalk by the beach. We thought perhaps the wind might die down in a bit and we would have some smoother sailing later. I took some pictures -- Mr. & Mrs. Cardinal (Glen's favorite bird) graced us with their presence, and it was a beautiful afternoon. The sky was a gorgeous blue, the sun sparkled on the water and the wind, while not conducive to kayaking, felt great while sitting on the shore. After a while we decided the wind wasn't going to settle down anytime soon, so we had our dinner at the picnic tables instead of out on the water: fried chicken and cole slaw. After our meal. and still hoping for a settling down of the wind, we sat out on the pier to watch the sun play on the water. The sound of the waves crashing on the beach and the feel of the wind on my face reminded me of being at Orange Beach on the Gulf of Mexico. I checked the wind speed, so we would have a reference in the future, and it was 15 knots, or 17.25 mph. I will remember in the future that this is just too much for us. We had met another kayaker when we first arrived, who was hoping to fish from his kayak. We noticed that he, too, had turned back. With a great deal of fishing equipment loaded on his boat, he did not want to risk capsizing and losing some of his equipment. Although we were soon packed up and head for home, after paddled only a few feet, it was still an enjoyable afternoon. May Day Park is a very nice park, with a playground for the children, picnic tables, a boardwalk and a nice beach area. I'm sure we will come back to it again on a day when we can go farther than five feet. 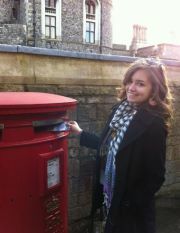 This past December, our daughter Emmie went to England and Italy. It was her first trip abroad and her first flight ever. You might have thought she would have had several reasons to fear: going so far away, flying for the first time -- and a transatlantic flight at that, being in new countries, one which doesn't speak English, dealing with different currencies. But Emmie was not afraid. She was excited and thrilled. Why? Because she had a friendly guide. She was traveling with her boyfriend and his family, who are from England. While the country was all new to her, it was home to them. Emmie, Sheldon and his family had a wonderful time during their month in Europe. She had a great time because she was guided by kind, knowledgeable persons during her stay. When we know where we are going, or we know the person who is leading us knows where they are going, we can be at peace. If we don't know where we are going, then fear truly does tend to set in. Sometimes we look ahead to our future and we begin to let the unknowns of it frighten us. We have not been there. We don't know the "currency" of it, so to speak. We don't know how things will go. But if we are Christians, we have a kind, friendly guide to take us each step of the way. As Sheldon and his family protected and led Emmie through the streets and by-ways of England, our Lord will lead us and protect us through the twists and turns of our future. It does not mean we will be pain-free. Neither was Emmie. She took a bad turn on a narrow flight of stairs and broke her toe while she was gone. But she was cared for by a most gracious and loving family. Whatever the darkness of the future holds for us, whether it is a sunny day of sight-seeing or a painful night in the Emergency Room with a broken toe, we can know that our Lord is there. He is with us and in us and there is nothing that will befall us that has taken Him by surprise. He is our friendly Guide, our Comforter and our Protector. My sister has a very special notebook. It is filled with letters. Not just any letters, but letters between my grandfather and my grandmother. After my grandparents had met, both were members of the Salvation Army, he had to return to his parent's farm to take care of his ailing father and step mother. He and my grandmother were only friends at the time. The letters tell of their day-to-day activities, sometimes giving vent to frustrations or wishes for things to be different. As time progresses through the letters, you can also see their relationship progressing. Slowly, gradually, they are falling in love. In one of the last letters, my grandfather proposes. In her next letter she accepts. The final letters have to do with the arrangements of her transportation to the farm. Finally, he sends her the money for a ticket and there are no more letters. I think that my grandparents drew much closer to each other through the letters than they would have if they had actually been in the same city. How many times do you think they read each letter before the next one arrived? How often did they think about the other person reading the letter they had sent, what they thought and what they would reply? Conversations might never be so examined and considered, for they are fleeting, transient, ethereal in nature. But a letter, ah this is something we can hold, we can fold, we can re-read, we can treasure. For three years I worked in the computer department of our hospital with the purpose of helping to build one particular computer system. For the first several months after I arrived, that system was down more than it was up and my main purpose in work could not be performed. Glen frequently sent me emails -- electronic letters, and I frequently responded. Many of those emails I have printed, folded and wrapped in ribbon in a special box. They are as valuable to me as those letters my sister has from my grandparents. They are tangible tokens of love. Perhaps that was why it was necessary for the Lord Jesus to return to heaven after His resurrection. Maybe the Lord knew we would have a greater experience of faith, trust and hope if we had to depend upon His word instead of having Him physically here with us. As the Scriptures say, "As for God, His way is perfect." Knowing this, we should take every advantage of those tangible tokens of love we have from our Heavenly Father -- the Scriptures. We should read and reread those letters to us. We should contemplate their meaning, their inference in our lives. We should use them as the basis to anxiously await the day when we will be reunited with that great Love of our lives, the Lord Jesus Christ.